Thank you very much for your interest in booking hotel accommodation at the Estrel Hotel. Shortly, the DOG Congress will open its doors, therefore we can no longer offer you an online booking. The 27 sqm standard rooms offer luxurious living comfort. Their contemporary designs feature bright natural tones for a welcoming atmosphere. The rooms are additionally equipped with modern furnishings and spacious working and storage spaces to meet the needs of business travelers. 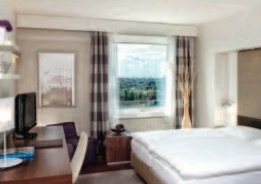 The deluxe rooms at the Estrel Hotel Berlin are spaciously sized at up to 34 sqm and feature top quality furnishings. They are equipped with a large desk as well as all modern communication facilities (e.g. DSL internet access). A comfortable bathroom and the double bed with two mattresses give you time to relax. 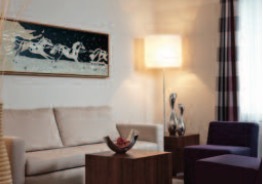 The junior suites are comprised of a combined living and sleeping area sized at up to 55 sqm. They have a comfortable bathroom and a desk as well as all modern communication facilities. 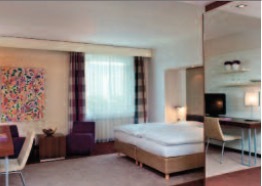 All junior suites are equipped with a double bed with two mattresses. 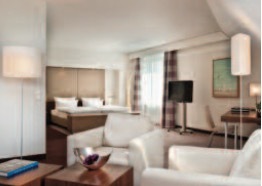 The suites range in size from 57 to 85 sqm and are located in each of the Estrel Hotel’s four wings. They all feature separate living and sleeping areas, cosy seating areas, a large desk and more than ample space for personal items. They have a comfortable bathroom and a large desk as well as all modern communication facilities (e.g. DSL internet access). All suites are equipped with a double bed with two mattresses. Note: Economy standard rooms do not dispose of ventilation with open windows. They are ventilated via the hotel’s atrium roof. The mentioned prices (Euro) include VAT. Breakfast is include with Euro 19 per person and night.